Have you ever had the choice between eating a two month old and three month old burrito? One is technically less bad, but neither is appetizing. That’s the choice currently presented to Florida voters in the race for governor there. I wrote in July that Floridians disliked both Democrat Charlie Crist and Republican Gov. Rick Scott. Yet, voters must pick one, and right now Crist appears to be — by a hair — the more popular choice. Crist led in the vast majority of polls conducted early this year. But much of that lead was built on his bipartisan appeal; Crist was once a Republican after all. The problem for Crist, of course, is that he’s now a Democrat (and arguably only became one once it was clear he couldn’t win as a Republican — see the 2010 Republican Senate primary). Scott’s folks began an advertising assault on Crist that clearly had an effect on Crist’s standing. Scott has outspent Crist $43 million to $25 million. Crist’s 5 percentage point lead (seen in the local regression graph above) fell precipitously through the first half of the year. It was gone by the beginning of June. Through the summer, Scott held a small lead. Of the 18 polls taken from June to August, Scott was ahead in 12 and behind in just four. But a look at the chart shows something has happened over the last month: Crist has come back. According to the local regression, Crist’s lead currently stands at just about 1 percentage point. This change in momentum is best seen in the SurveyUSA tracking poll done for WLFA-TV. In the three polls taken since Sept. 26 by SurveyUSA, Crist has been ahead in all three by an average of 4 percentage points. He was behind in five of their previous six polls by an average of 2 percentage points. Why has Crist suddenly regained a slim edge? It’s arguably the same reason he fell behind in the first place: money. While Crist has been outspent through the majority of the year, he wasn’t outspent in the the week in which he began to climb in the polls. According to the Tampa Bay Times, Crist and Scott each spent $3.4 million from Sept. 27 to Oct. 3. In other words, the state tilted slightly more towards Crist when the two candidates were on relatively equal financial footing. 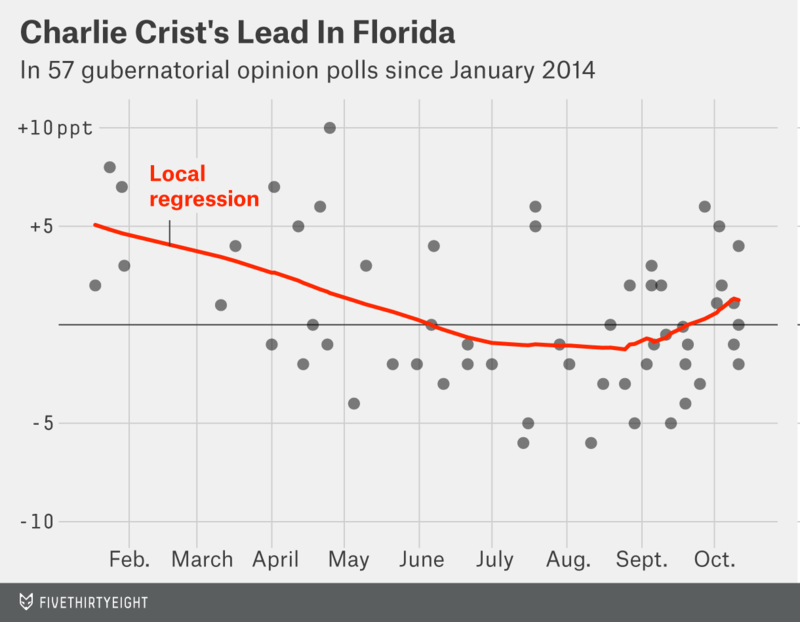 Crist’s rise doesn’t mean he’s become more popular since July. The advertisements from both camps have been as negative as ever, and both candidates are as unpopular as ever. In the latest SurveyUSA survey, Crist’s net favorable rating (the percentage who view him favorably minus the share who view him unfavorably) was -10 percentage points. Scott’s was -8 percentage points. A CNN poll put Crist’s net favorable rating at -11 percentage points and Scott’s at -7 percentage points. That’s actually worse than in the beginning of the year, when Crist had a net favorable rating of -2 percentage points and Scott was at -5 points. It also means that this election will set the record since 2005 in a gubernatorial campaign for candidate disdain by the voters. Luckily for Crist, elections are choices.